Through my blog, you probably have come to understand that, Diamonds, can come in a range of colours from reds, pinks and even blues hues. But when we speak of Yellow Diamonds, could the colour that drops the value of a white diamond dramatically increase the diamond of a fancy coloured diamond? Although the most popular colour seen in the diamond colour palette, these Canary coloured gems can surely steal a place in your heart when you see spectacular and vibrant stone. Amounting to only 0.1% of diamonds that are uncovered from nature, these fancy coloured diamonds are some of the most rare and valuable gems available on the market. Through this post, I will introduce you to facts and why diamonds take on a vivid yellow colour. Canary’s as they can be alternatively referred to, are just like the white transparent diamond, we see popularly studded in jewellery. In terms of its hardness and physical properties the two are identical, however, their optical properties are world’s apart. With the brilliant colour of the sun, these gems get their colour from the trace element ‘Nitrogen’ that intertwines into the gems chemical composition, which is otherwise composed solely of Carbon atoms. Yellow tints are known to lower a diamond’s value upto the Z colour grade on the normal grading chart yet on the Fancy colour grading chart the yellower the stone gets, the more valuable it becomes. To be able to understand a diamond a little more, diamonds come in different sub categories based on the content of Nitrogen or Boron present within it. Type1 Diamonds have Nitrogen in their chemical makeup and are subdivided further into categories Type1a or Type1b on the basis of the proximity of the nitrogen atoms. Whereas Type2 Diamonds that have Boron in it’s chemical composition, make its a better semiconductor of electricity giving the latter its use and demand in the electrical industries. Type1a diamonds have the colour giving nitrogen atoms grouped next to each other giving a fainter colour thereby making up 98% of all diamonds unearthed. These are the type of diamonds you will commonly see in the market, the stones falling between colour grades G to Z. These Type 1a stones in large sizes can reach vibrant golden hues although rarely occur as big rough crystals. Type 1b diamonds on the other hand have the nitrogen atoms spread out around a vacancy in the chemical composition. This ends up absrobing the cool colours in the visible spectrum thereby, emitting a stronger yellow, orange or brown body colour. Commonly known as “vivid” or “intense” these stones are the rarest of all. Over the last month on my visit to the United Kingdom, I met up with an old friend, Karan Aswani, who currently runs his own business called Diamonds & Diamonds Ltd. Based in the heart of London’s Jewellery District – Hatton Garden, Karan focusses on what his consumer wants and balances it, with timeless designs and value for money. Having trained with the best at GIA’s London Campus, Karan hand selects each diamond used in his jewellery. From the clarity characteristics, colour, cut features like table percentage, depth, girdle thickness and the most important “Jaan” or brilliance of the stone, his pieces have unmatched beauty. While I was there, I had a chance to see two really rare diamonds, and wanted to take the opportunity to share them with you. The first diamond Karan showed me is known in the diamond trade as a ‘Chameleon’ diamond. Chameleon diamonds are extremely rare, as they are natural diamonds that change their colour based on two external factors being light (photochromic) and heat (thermochromic). The image below is of a GIA certified Natural 0.95 Fancy Deep Brownish, Greenish Yellow Chameleon diamond. When exposed to an increase in temperature, the stone changes to a vivid yellowish-orange, with a balanced hue, tone, and saturation. 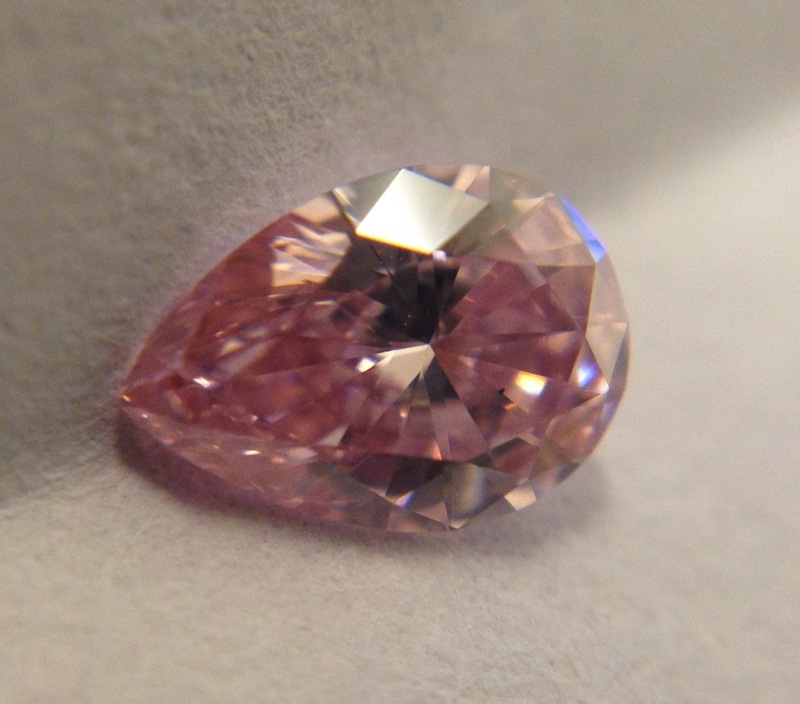 The second stone that I was able to see was a GIA and an Argyle Certified Fancy Intense Pink diamond. This Pear Shape diamond with its VS2 clarity is a rare pink diamond and is mined from the Argyle Mine in Australia. The hues, tones, and saturations seen in the pink and red diamonds from this region are the best of their kind, and sell for high premiums, because of their extreme rarity, mainly through private auctions.